Weather overcast but dry, turning to sunny spells around noon and a shower at 3.40 p.m. Although there was a little rain overnight, it hasn’t had any effect on the site, which is still dry and powdery. We really could do with some rain! My thoughts about Mick’s pit have changed after thinking about it overnight. 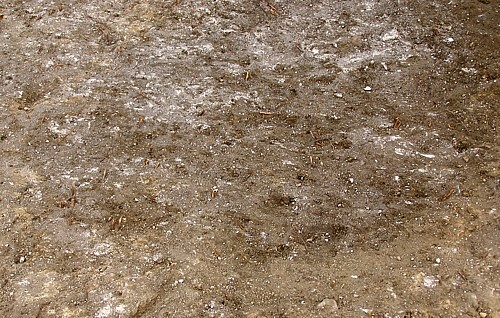 The chalk floor of the barn is clearly sealing it to the north-east and it has not been cut through later deposits. What has happened, I think, is that material has eroded from the building platform down into the hollow of the farmyard, exposing the top of the pit where it had formerly been sealed by the chalk floor. This would also explain the poor survival of the south-western wall of the barn, which is represented by only a few bricks and cobbles half way down the slope. Erosion isn’t something I regularly think of as a site formation process, as deposition and truncation are the more obvious anthropogenic processes and silting the most obvious natural type. We need to get some more finds washing completed, as we are getting very behind with that aspect. The large crowds I feared would turn up at weekends have not materialised and we have only eight people here today. Mervyn and Chris are washing the finds, as neither has done this before. The probable trampling material, (12), that Tony and Nigel are excavating seems to be spreading almost across the width of the barn, probably significantly between the positions of the two doors. The underlying chalk surface is definitely continuous between them and it is probably later truncation that has removed (12) to the north-east. Muriel and Frankie are excavating the remains of (9), so that by the time they have finished, there will be no more demolition deposits left and we will be into pre-1930s archaeology everywhere. The yellowish weathered chalk material making the floor of the barn is rising up next to wall (7), suggesting that the level has been worn down towards the centre of the building, which seems reasonable enough. Mick is now recording the fragments of wall on the south-eastern side of the barn. There is very little of it left and it appears to be sitting on the make-up material of the floor, suggesting that the platform was constructed before the barn, which seems a slightly odd sequence, but as there is no trace of the foundations elsewhere on this line, it has to be the explanation. It is perhaps a post-medieval equivalent of building on a concrete floor-slab. The weather is becoming more overcast as we go through the morning and some of the clouds look distinctly rain-bearing. It would be good to have the occasional shower to show up colour changes more effectively than has happened so far. I keep thinking that I can feel the odd raindrop, but nothing more definite is happening. We’ve now been excavating for two weeks, so by the end of today, we’ll be halfway through the fieldwork. It’s gone rather slowly, with probably too much time taken up with sorting out post-demolition contexts that haven’t given us a great deal of information. But as a training exercise, I suppose it was good to get people used to digging carefully, recording by single contexts and processing finds. I’m getting worried about the “floor makeup” under (9): it’s very thick and not demonstrably archaeological in nature at the moment. It strikes me that it’s so similar to the material underlying the farmyard that it could be the natural, although I’d expected it to be clay on top of the hill, as it is nearby. Once we’re able to investigate it, I think it will be worth using mattocks to examine a slot through it to see if we can locate an underlying deposit. If it does turn out to be natural, we don’t have even a week’s work left on site. On the other hand, if it’s an archaeological deposit, it’s going to need a fair effort to remove it. Greg is excavating (12), which does not appear to be distinct from the material underlying the rubbly deposit I am assuming to be the farmyards surface. However, he has excavated an iron nail from it, which suggests that it need not be natural. It’s still puzzling me, as it’s possible that something the size of a nail could be intrusive. By lunchtime, we are having sunny spells, so the promised showers aren’t happening. This is a real shame! It’s not as warm as yesterday, so we’re not having the frequent water breaks. David Hillelson and Helen Ashworth called in towards the end of lunchtime to look round the site. David thinks that Heritage Network established a bench mark on a drain cover in Norton Road during the excavation at St Nicholas’s School during the 1990s, so I need to check the archive to see where it was and what its value was. There’s a good chance that it is still there. David also suspects that they may have created a temporary benchmark on something solid in the grounds of the school: it would be even better if we could locate that. He also suggests that we contact Jane Cowgill about the industrial residues, as they are her speciality. Helen confirmed that the material from (11) is all either Romano-British or medieval (principally Saxo-Norman). This is yet further evidence that the pit pre-dates the barn, in which case, the yellowish material underlying everything else cannot be the make-up for the barn floor. At the bottom of the pit, the yellowish material becomes increasingly solid and resembles unweathered chalk, which is presumably what it is. Our main hopes for continuing the excavation beyond next week now lie with discovering cut features underneath the putative farmyard surface to the south-western end of the trench and under (15), the chalk floor of the barn. Paul Palmer called in just before afternoon tea (I say ‘tea’, but it’s really just a break for water). He’s off to Australia in the middle of next week, so he wanted to see the site before he leaves. Following a brief shower of rain at afternoon tea break, I can now see some potential features under (15), including a possible pit and possible posthole. They could be contemporary with the pit containing (11) – which I am assuming is medieval – or earlier. On the other hand, they may just be hollows in the natural that filled with soil before (15) was laid. By the end of the day, the possible pit is looking very convincing, with chalk from (15) compressed down into its upper fill; it looks to be oval. The chalk in the south-eastern corner of the trench is also beginning to look like capping to pits underneath the farmyard. In one place, there are cobbles from the yard surface pressed down into and partly overlain by the chalk, so it can hardly be the natural bedrock. They are presumably of post-medieval date, otherwise they would probably have been truncated to a level below any capping during the formation of the sunken farmyard. I need to check with Deborah Giles to see if there is any information about when the farm might have been established. As 125/127 Norton Road is seventeenth-century at core, it seems likely that the farm was in existence by then and was not a later development. Posted on 12 August 2007, in Fieldwork, Norton Church Field Dig 2007. Bookmark the permalink. Leave a comment.